Garanti Web Review 2019: Is Garanti Web a Good Hosting? An affordable Turkish website hosting provider offering a range of services including website hosting, domain registration, and email marketing. Founded in 2000, Garanti Web is a Turkey-based website hosting provider with servers in Turkey. Their website (also in Turkish) does not say much about how many customers they have or where they are located. Garanti Web offers a full suite of website hosting services including Windows hosting, Linux website hosting, Linux and Windows dedicated servers, reseller hosting, domain registration, and SSL certificates. They also offer some website solution services such as email marketing and brand registration. For e-commerce websites, Garanti Web offers some excellent value-adds including ready-made e-commerce store templates, backend requirements for product upload, invoicing systems, virtual point of sale (VPOS), shopping cart, and product pages. They even provide an online demo of their e-commerce store, so you can try it before you buy it. In short, Garanti Web provides a well-thought-out offering for a new website owner looking to start an e-commerce store. Their e-commerce package is free with the most expensive website hosting plan and is available for an additional cost with all other plans. They also offer some other nice features for beginners, including ready-made website and blog templates that can be edited as needed. While the blog is free with all packages, the website tool is free with all but the most basic plan. They also offer website visitor analytics, which is great for beginners who do not want to worry about setting up Google Analytics or other third-party analytics tools. It’s relatively easy to get set up. As with most companies, you can purchase and pay for your website hosting online, but the signup form does look a little daunting, and the process could be streamlined for a better user experience. Garanti Web’s prices are very affordable compared to local and international competitors. In fact, their annual price is as low as some companies’ monthly prices. But beware that the lowest two packages will likely be too low-spec for many customers. It’s also important to consider that domain registration and SSL certificates come with added costs. Prices are listed only in Turkish Lira, which may be indicative of their Turkey-only targeting. Garanti Web offers a remarkable range of contract lengths from one year all the way up to ten years paid up-front, with a small discount for longer terms. There is no month-to-month option, and no free trial or a free version, but they do offer a 15-day money-back guarantee. Customer service provision is quite limited. They only offer telephone and email support, and frustratingly do not advertise their hours of business. Whilst they do have a Facebook page with messages enabled, I’d personally prefer to contact them via live chat on their website. There is a small knowledge base containing help documents to help answer your technical questions. Garanti Web offers a full suite of website hosting services at affordable prices. 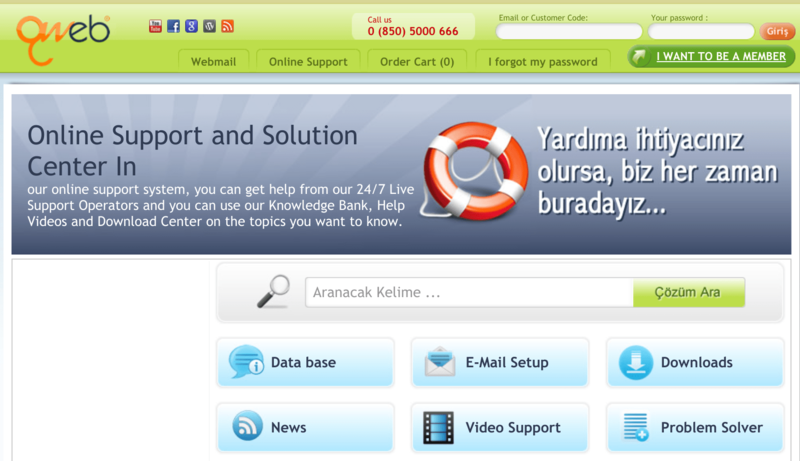 With the website, support, and cPanel available in Turkish, its services are primarily suited to the Turkish market. Wondering how Garanti Web stacks up against other Web Hosting companies? Enter any other Web Hosting company and we will give you a side-by-side comparison.